I keep saying that it's hard to believe that summer's over... Every year seems to go by faster and faster! When I open my calendar and see that we only have four months left of this year, I'm like what?? And douse myself in Lavender because the thought of time moving by so quickly gives me the heebie-jeebies. Before I get into the blends, I want to talk about a question I got this morning, and receive from my oilers pretty often, and that's, "how many drops of oil should I use in my diffuser?" The answer is sort of silly but simple: however many you want to, really - your body will tell you. I know that sounds ridiculous but it's true. Some mornings I wake up craving citrus, and a lot of it. Other mornings a single drop of Lavender or Cypress is all I need. Listen to your body and give it what it wants. Through my nose, my brain will tell my body what to do, and whether or not to add more. Start with just a drop or two and see how your body reacts. If you find that you want more fragrance or are having a hard time sensing the oils in the air, add another drop. If you feel like it's a little much, don't dump your diffuser, take a little cup and scoop some out, saving it for later so you're not wasting the precious oils. Then add a little more water to the diffuser, or move the diffuser to a wider space so the scent spreads out a bit more, allowing it to be a little less intense. I personally wouldn't add more than 8 drops total of any oil or blend or to me you're wasting your oils. We all know that sometimes oils come out faster than others depending on their viscosity. Patchouli comes out suuuper slooowww where Valeriancomesoutfasterthanyoucaneventryandstopit! So don't be afraid to experiment, but don't waste your precious oils either. NOTE: The amount of drops you use depends on the size of your room and power of your diffuser. Which diffuser do you have? Is the space you keep it too large? Maybe you need to compensate with another diffuser on the opposite side of the room. Homes with tall ceilings or open floor plans often need to balance their space with a couple diffusers, where homes with smaller rooms and average ceilings typically do well with just one diffuser per room. You guys know how much I like the Luscreal diffuser from Amazon (purchase link) because it's inexpensive, holds 450ml of water, and lasts a long time. It's not the highest quality but it's perfect for rooms like the kitchen, my office, and for moving around to difference spaces when you might want to diffuse for a short period of time. Our nicer diffusers like the Aria and Desert Mist stay stationary in our living room and bedroom. The Aria is not shown on this chart but will diffuse nicely in a 430 sq. ft. room. Browse Young Livings diffusers here. Alright, let's get into the diffuser blends! If you don't have some of these oils, I'd be happy to help you develop similar blends with the oils you have, just shoot me an email! Consider adding some of these to your next order though, you'll love them! For directions on how to place an order, click here and scroll down to the section that talks about how to re-order via a Quick Order or Essential Rewards. This blend is much healthier for you than the soda is, I'll tell you that much. :) Super invigorating, refreshing, sweet and familiar smelling, and an energizing pick-me-up any time of day, but especially in the morning. You're gonna want a cocktail while diffusing this blend... Play around with the accent oils (Grapefruit and Orange) but definitely use the Lime and Spearmint as a base. It's fresh, summery, juicy, and intoxicating with the Spearmint. These scents together give such a mellow vibe with a touch of uplift with the Grapefruit citrus. It's a good one for the afternoons when you're a little stressed from the work day but you still need to focus and get some work done. It's also a great roller blend wear on the beach while you're under the umbrella reading a good book or listening to some reggae. Such a nice good-vibes-only summer blend! This has been my go-to blend all summer long, and I plan on diffusing it well into September. (I'm not quite ready for fall blends just yet... waiting until the end of September at least!) This is so awakening, a little zesty with the hint of lime, and cleansing with a touch of Eucalyptus. This blend just puts a smile on my face! Become inspired by these blends and try to make a few of your own! And again, don't let trying new blends intimidate you. Just go for it! And listen to your body. It'll tell you if it's a fan of what you've concocted pretty much immediately. 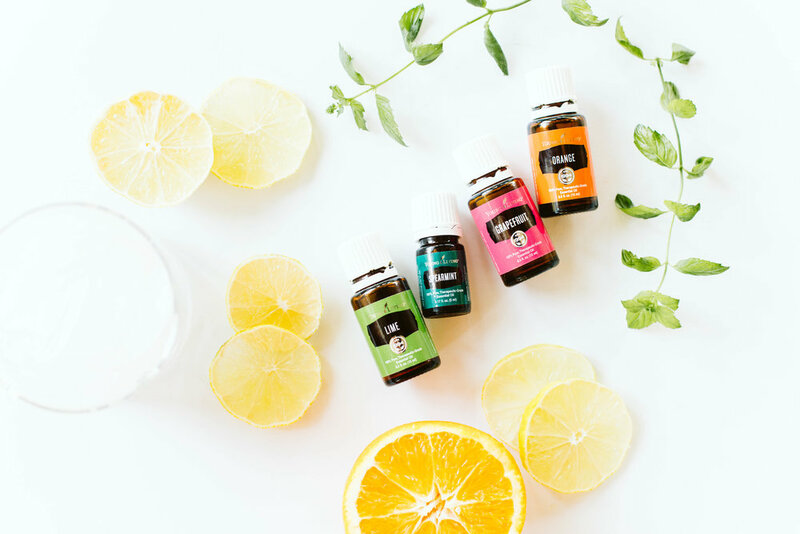 But unlike candles, air fresheners, and other scented products, we can trust that diffusing these essential oils actually provides our home with health-supporting ingredients rather than harsh chemicals that affect us in a harmful way. Hope you've had a good Labor Day weekend spending it with friends and family doing something you enjoy. We all work so hard so it's nice to take time and celebrate the strength, prosperity, and workforce contributions that have been made in this country. Here's to the hustle - for all of us who do it day-in and day-out to make a living for ourselves and our families. Thank you! Cheers to you - cheers to us!